The Texas and Pacific Railroad depot in Marshall, Texas. The Union Pacific Caboose is a little out of place. The recently restored (1999) depot can be reached from an underground tunnel that was added in 1940. The staircase is visible from the parking lot at the northern end of Washington St.
From the 1900 Courthouse, go north and you'll find the Depot on the other side of the highway at the very end. This depot is one in a series of T & P depots along its Texas route. The T & P went as far as Sierra Blanca and then shared the rails to El Paso with the Southern Pacific Railroad. Mr. Ginnochio was an Italian immigrant who built restaurants along the T & P's North Texas stops. He became so wealthy he even built a house next to his to keep his bartender available in all sorts of weather. "Texas and Pacific R.R. Shop, Marshall, Texas"
The courthouse on the southern end of Washington Street and the depot on the northern end defined the main street of Marshall. 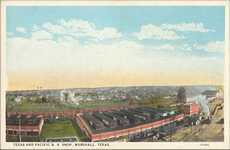 The same courthouse-depot plan was also used in Baird, Texas - another Texas and Pacific Railroad town.